He doesn't have the rock star appeal of a Kobe Bryant. And he doesn't play for the Los Angeles Lakers, a glitzy franchise jaded with 17 NBA championships. 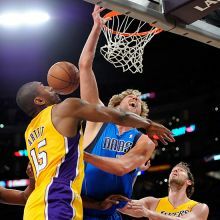 But I like Dirk Nowitzki just the way he is. A Dallas Maverick. And so should you. I mean, what's not to like? Dirk has the folksy charm of a country singer --- kinda cute, a little bit shy, but devastatingly talented. He makes the 3-point shot look easy like a lay-up. He shoots jumpers on one foot, fading away. How many 7-foot forwards out there can do what the 32-year old Dirk has done, which is shoot lights out and consistently lead his team in scoring for 11 straight years? Don't even bother counting, dude. There's nobody else. The 245-pound Nowitzki is averaging 26.5 points, 8.4 rebounds and 2.8 assists in this postseason. In 10 playoffs games thus far, he hit 12 of 20 3-pointers, a stunning 60 percent. And he sinks free throws with his eyes closed, 89.9 percent. Dallas, as a whole, is a pretty good-looking team. And if you think the Mavs are still soft, a label they got based on previous failures, think again. THEY SWEPT LA, 4-0, in the West Semis, They took the bluster out of those Lakers, dulled their so-called Triangle offense, and embarassed the Zen out of Phil Jackson, whose last game as a coach was the indignity of a 122-86 defeat. Besides Nowtzki, the other Mavs are just as fun to watch. Like Tyson Chandler, a 7-foot-1, 235-pound center, who epitomizes the Mavs new-found toughness on defense. Chandler hauls rebounds by the buckets, he blocks and alters shots with his quickness, and his glare seems to tell opposing players -- "drive the lane at your own peril." Still playing relatively heavy minutes, 33.6 per game, Jason Kidd is playing like a guy with a time machine in his garage. At 38, he is averaging 10.1 points and 7.2 assists per in these playoffs. As if one Jason is hard enough to deal with, Dallas has two. The other one being Jason Terry. After the Mavs eliminated the Lakers last Sunday, Terry lavishly labeled himself as one the "three most prolific shooters in the game." But who could argue? He scored 32 in that Game 4 and he sank 9 of 10 3-point baskets. For the math-impaired, that means Terry made 90 percent of the shots that he fired at least 23.8 feet away from the hoop. If that doesn't blow you away, you must be made of cement. SHAWN Marion, DeShawn Stevenson, Brendan Haywood and ex-Sacramento King Peja Stojakovic make up the deadly explosive 9-man rotation of coach Ric Carlisle. Like Terry, Stojakovic went wild in that fateful Game 4 versus the Lakers. He went perfect from the 3-point line, 6-forf-6 before ending up with a total of 21 points. You think he's done, eh? Yes, the Lakers are out of these playoffs, but these Mavs are a thrill to behold.